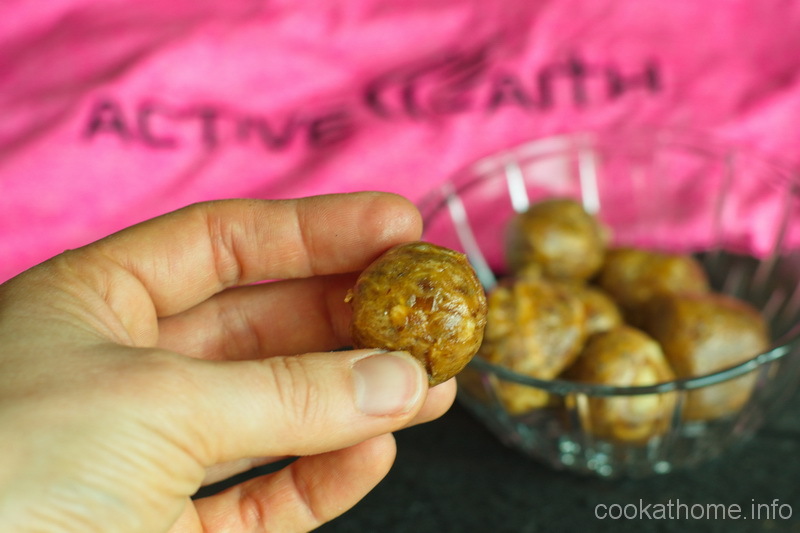 When you want and need a snack, either before or after exercising, give these naturally sweetened, Paleo friendly chia nut energy balls a go! I’ve recently become more aware of eating small snacks before and after exercising. For years, I would wake up early and exercise before breakfast, and think nothing of it. Until I did the Whole30 program and followed their recommendations of no snacking in between having 3 decent meals, following their template. And realized that I was always getting quite hungry in the afternoons. And even though I was snacking on technically compliant foods, I wanted to get the most out of the program. So I looked further and found they recommended having pre- and post-workout snacks. So I tried having things like hard-boiled eggs, sliced meat and avocado, nuts etc. Side note: The shirt in the photo above was given to me from one of my friends at church – I often wear it during the winter months when I exercise! Thanks Laura! Feel free to check out her blog for other awesome recipes! While I realize these energy balls are not technically recommended for the Whole30 program, I still think they’re pretty neat and so yummy. 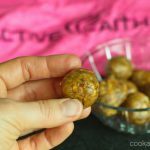 And they are only sweetened with dates, with minimal other ingredients in them (use Crazy Richards almond butter if you can find it – nice and no unhealthy ingredients!). Combined with a good balanced meal as part of the rest of your daily eating, I have no problem recommending these, mainly before exercising, but I’m sure you can eat them after as well. Give them a go – I love them and I think you will too! Process all ingredients together in a high power food processor until they hold together in a paste. Leave some chunks in for texture. Roll into tablespoon-size balls and place in a storage container. Chill for at least 2 hours in the freezer or refrigerator. Great one for me since I’m not eating sugar still…I’m down 20 lbs and feel great! Thanks for the push Sarah! Glad to be of service – I’m still struggling with the portion control side, even of healthy things but it means a lot that you’re doing so well!